Anthem is the game that many are looking forward to. Someone has even described it as the game that Destiny 2 should have been. We at X35 Earthwalker are looking forward to Anthem. The demo was released on the weekend and many got to try and see what’s happening. Let’s take a look. You start of in the social area or more like a city. There are npcs to talk to. 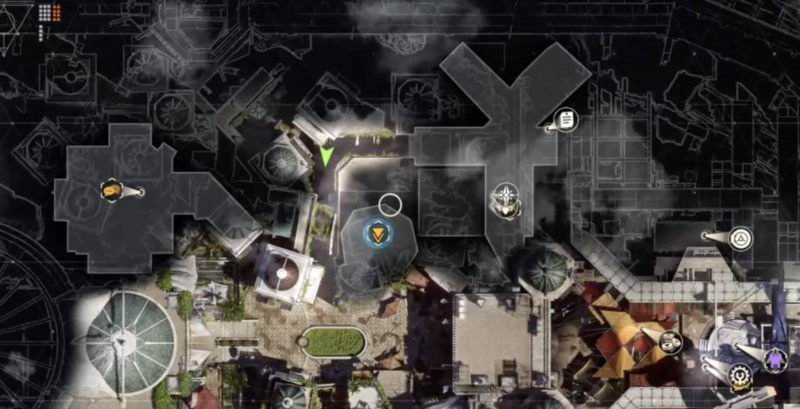 Some like Lucky Jak seem like they will have challenges or some stuff for players to do for them, judging by the icon he has on the map. Another person marked on the map was a bartender named Amal who brings up very interesting conversations. He talks about situations that he wants advice on. For example a married woman making moves on him. Off course any respectful, decent normal person will advice the man to be straight up and tell her “No”. People like Amal and Lucky Jak are marked on the map with icons. Speaking of maps. 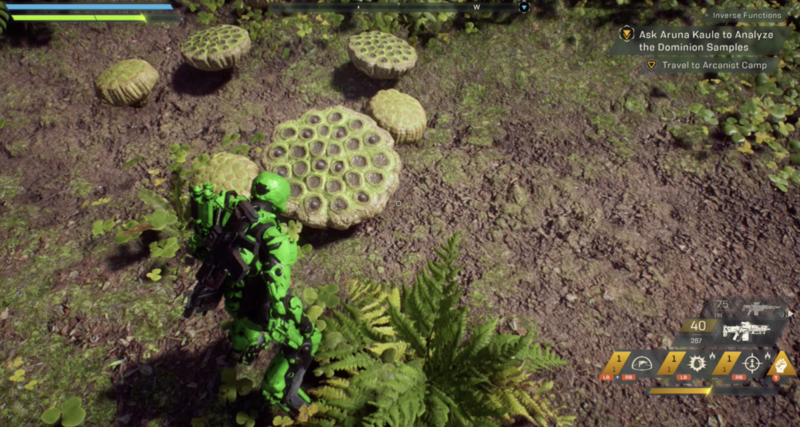 The world map in Anthem is very good. It’s very detailed, option of displaying legend (what the symbols represent), quite clear what’s outside and what’s inside. Even the lighting on the map works well. Even the maps of the areas you go to on expeditions and missions looks great and easily helps players around the place and finding their objectives too. So there shouldn’t be any excuses for getting lost. Just stop running and look at your map… for once. As you go through the market place in Anthem, you will find traders and people who sell cosmetic gear. Just how the people move about and talk to you shows how alive the game is. For example you can walk up to some people and they will turn their head to see you. Then some even say something to you. Then if you leave, they go back to a conversation. The conversations are very good. They actually talk about different things like regular people but obviously not as good or fluent. The people look good by the way. They have their own looks and design and you can see all the hard work that went into this. You can approach your Javelin and customise it fully. You can customise the load out which consists of regular weapons, Assault launcher (javelin attached weapon), components, grenade and support gear. You can select two weapons to carry from a variety of weapon types like sniper rifles, pistols, assault rifles etc. The assault launcher can carry that useful weapon that’s attached to your suit. For example you can fire a seeking missile that does home in on a single target. Components that you can add to enhance your javelin in certain functions like ‘armour reinforcement’ which increases your javelins armour or ‘melee inscription’ which boosts melee weapon damage. Support gear is like additional abilities. For example you can select the ‘Bulwark point’ which creates a spherical shield that protects you from projectiles. 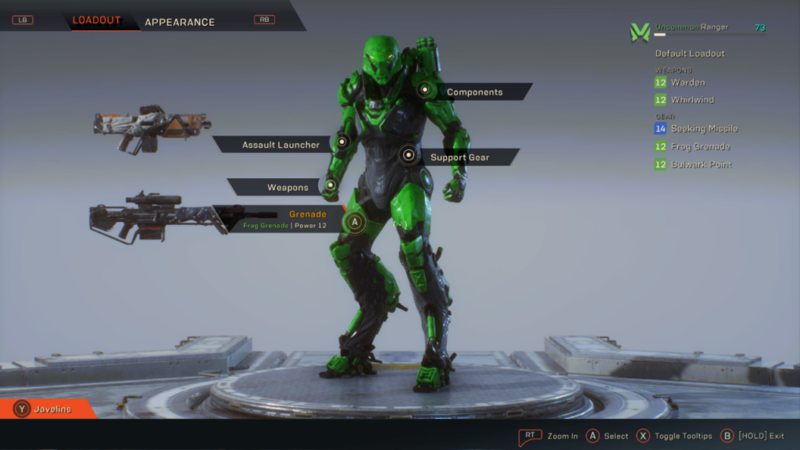 If you go into appearance you can customise how your javelin looks and even behaves. So things like: helmet, legs, arms, chest, paint, vinyls, notes and animations and a bit more. You can unlock and craft these items too so make sure to find those resources during missions and more. It is very detailed and as you can decide the type of paint too. There is clean, metallic panel, old and much more that give that textual look. So it’s actually deep and you will spend some minutes in there. On the expeditions and missions themselves you will have the main experience. You can run, walk, fight, explore and best of all fly at will. You can literally run and fly to wherever you want really. You can fly away from enemies if you are about to die. You can fly and hover over enemies to fire from above or come down with a strong melee attack. There is so much room and areas to explore. Enemies are all around too. Some in the form of enemy military forces with weapons. Other enemies are just the natural inhabitants of the world like big birds that can spit fire at high velocity. The waterfalls are very well designed with realistic effects. There are giant mushrooms that actually make great cover from aerial attacks. There are enemy built structures and camps that off course if you go there, expect a real fight. While you are running around on expeditions and missions make sure to look out for resources that you can collect. They do stand out on the map and are worth collecting from our experience. Not only that, there are certain boxes and possibly different items that contain information and lore. For example during the expedition X35 Earthwalker found a chest that when opened text come out. Looks like an entry log from a freelancer. Sounds like under water exploration is one of the activities they did. This can also be clues and hints for the player too. interesting right. Anthem is definitely more team based. Sure you can definitely play it solo like we did but some things are clearly more for teams. For example there is a big mechanical boss that the players must face and let us tell you that boss requires a team to beat it. We beta it on our second try while solo but it kept spawning in many enemies with increased variety and more dangerous kinds. Enemies with lots of health and physical shields, enemies that snipe from a distance, enemies with energy shields, enemies that launch mines and bombs all while the big boss is shooting and launching rockets at you. A team of four would honestly make the boss easy. Solo, it is a serious and difficult fight. So remember, bosses are not a joke and should not be taken lightly. Overall when playing the demo we learnt a lot about the game. X35 Earthwalker will be releasing a new YouTube video showing something very important in the game and dangerous so make sure to subscribe and follow us to not miss that. 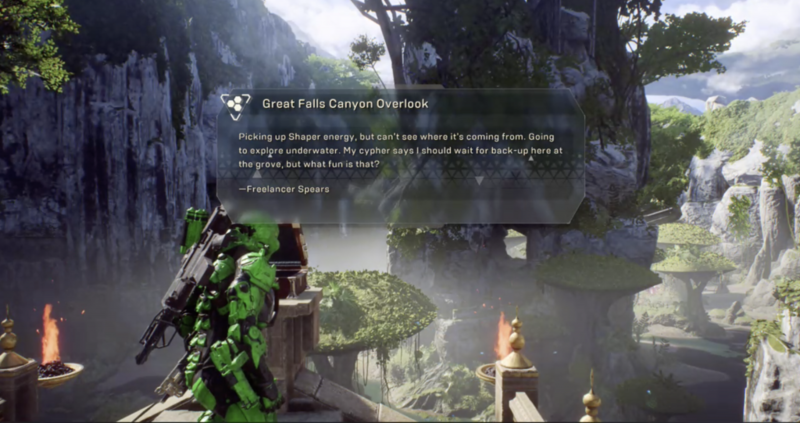 The developers have worked very hard on Anthem. You can tell by listening to the music, looking at the graphic, exploring the environments and variety of enemies. We at X35 Earthwalker are looking forward to seeing more of what Anthem will bring in the future.